Friands are one of those delectable little morsels for which cafes seem to charge an arm and a leg. Don't despair though - you can easily make these little darlings for a fraction of the cost at home and with CC it is just so easy. They are quick to make and wonderful to eat! 1. Preheat oven to 160 degrees. Grease 8 half cup friand pans. 3. When butter is melted add all ingredients (dry ingredients first). 4. Select Pastry P1 50 seconds. With 20 seconds to go, stop the machine and scrape down the sides. Resume program. 5. Place batter into friand pans, fill to 1/4 cm from the top. 6. Place in the oven for 7 minutes. 7. 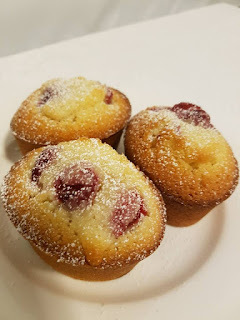 Remove from oven and place raspberries on top of friands. If using frozen do not defrost first or the juice will bleed into the batter. 8. Return to the oven and cook for a further 12-15 minutes or until the friands are firm to touch. 9. Remove from the oven and carefully use a butter knife to lift the friands out onto a cooling rack. 10. When cool, dust with icing sugar. NOTE - if you don't have a friand pan, you can use a cupcake pan.